One more post where we slide the Parlando Project and “other people’s stories” to the side and become more like a conventional blog. Last night in London was a blustery snow squall, but as Minnesotans who know that the Theater of the Seasons plays in Repertory, we were up and around throughout the day. Our target was the area around the Strand and Trafalgar Square to hit the National Gallery. We really only struck Trafalgar Square a glancing blow, though it seems an impressive urban plaza. 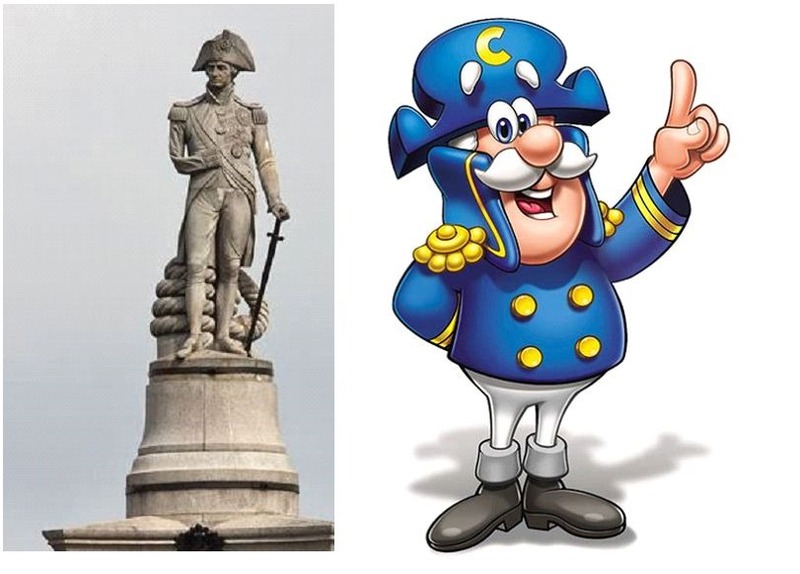 As we approached through the flakes and gusts, I pointed to the back of the column and asked my wife why they had a monument to Captain Crunch here. Faux-naïve humor aside, some of the best parts of the day were the little things. As we passed a small library I saw a poster in the window about Sylvia Pankhurst, the most radical of that suffragette clan. Inside was a small exhibit detailing the middle of her career in anarcho-syndicalist circles which lead her to a steadfast effort to warn against the rise of Italian Fascism in the years between the wars. 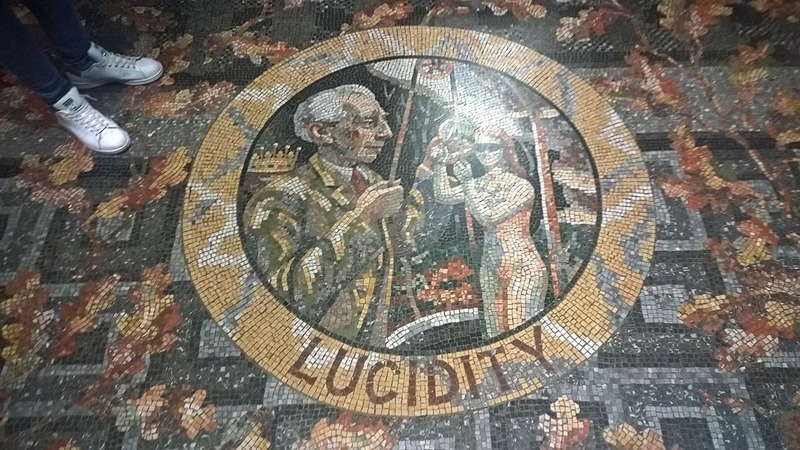 Some of the exhibit showed the efforts to extend Fascism to Britain through local London groups, which included the information that the library building itself had been formerly the headquarters hall of the Italian Fascist organization. Shortly after entering the National Gallery we noticed these mock Roman mosaics on the floor leading into the central gallery. At first glance, one assumed they’d be the sort of stolid decoration museums are known for—but wait, is that Bertram Russell? Winston Churchill? Turns out they are a set of witty between-the-wars comments on the modern virtues. “Don’t tread on Gretta Garbo…” sings Ray Davies in my mind. We’d come for a Pre-Raphaelite exhibit which showed how much these original hipsters loved to put mirrors, particularly convex mirrors, in their paintings. At the exhibit I learned that the art Academy the PRB bros rebelled against had been in a wing of the National Gallery building, a museum then full of the lush late Renaissance paintings loved by the 19th Century. As young rebels are wont to do, they instead looked to the earlier painters with their sharp Colorforms palette. We took a side-trip down the Strand until we came upon the Savoy Theater and then the grand Savoy Hotel. 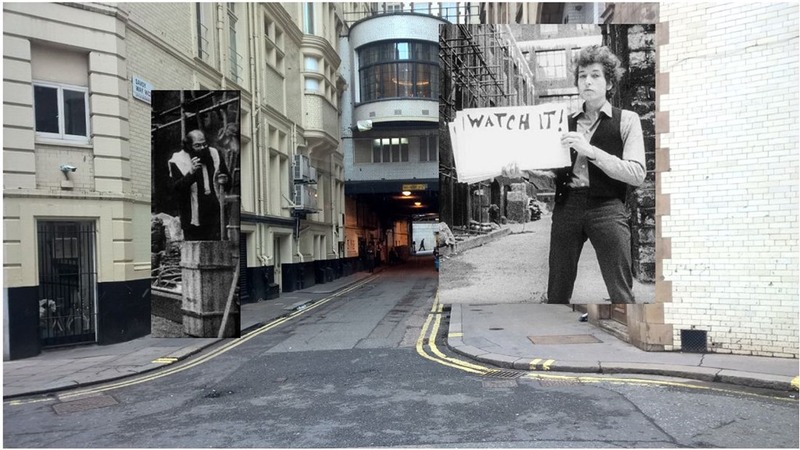 Our bootheels had to do some wandering, but, sure enough, we found the alley where the “Don’t Look Back”-“Subterranean Homesick Blues” was filmed, and where more than a hundred years earlier William Blake had lived and worked on his Dante “Divine Comedy” etchings as he lay dying. We couldn’t see the Thames to confirm if flowed like gold, what with all the buildings the years put there between Blake’s place and the river, but you could still see Dylan and Allen Ginsberg standing in that alley. That evening we went to a mostly Mozart concert at Saint Martins in the Field, which was fine. Now that I actually try to write string parts and play them via virtual instruments, it was nice to see hands play the articulations from a front-row seat. But, before the concert, we ate at “The Crypt” beneath the church, which is not just a goth-sounding marketing name, but the actual crypt, complete with grave markers. My wife wandered about the area, reading the grave markers, noting one for a five-year-old child. Everything in the past is beneath and beside us. Everything in the future is too, but we cannot see nor feel it yet.